VINTAGE ‘MILKCHURNS’ (Aluminium) hired by a customer for their WEDDING ……. 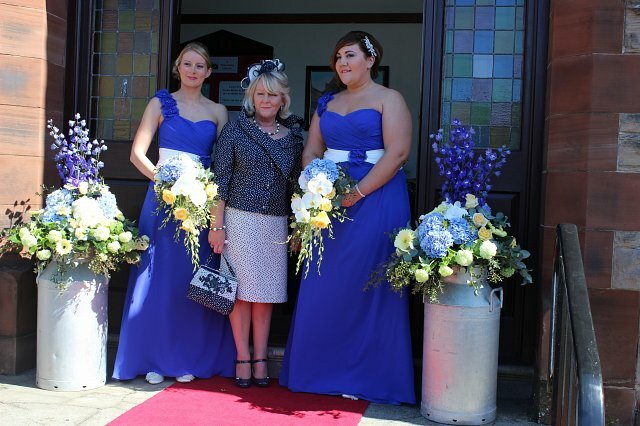 the bride’s flowers were displayed in the churns, at the church doors and at the head-table at the wedding reception! 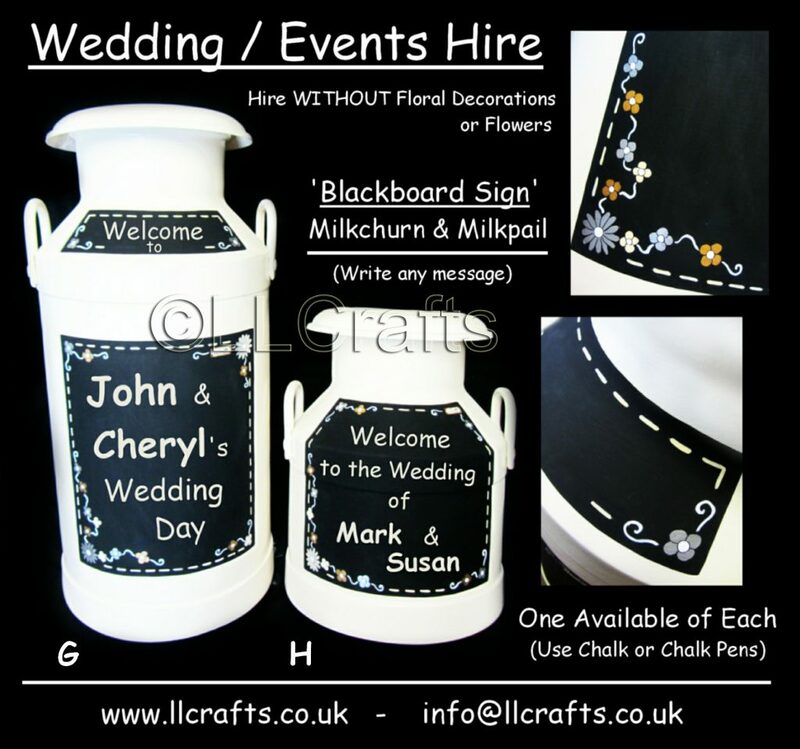 LLCrafts at Galgorm, Ballymena in NI, UK are pleased to have these beautiful ‘BLACKBOARD Milkchurn & Milkpail’ for HIRE …….. write a personal message for your guests or show them where your reception is! They are both fibreglass, painted ivory and the milkpail is table-top size! So contact Louise or Gloria ……. and add that personal touch to your wedding day! 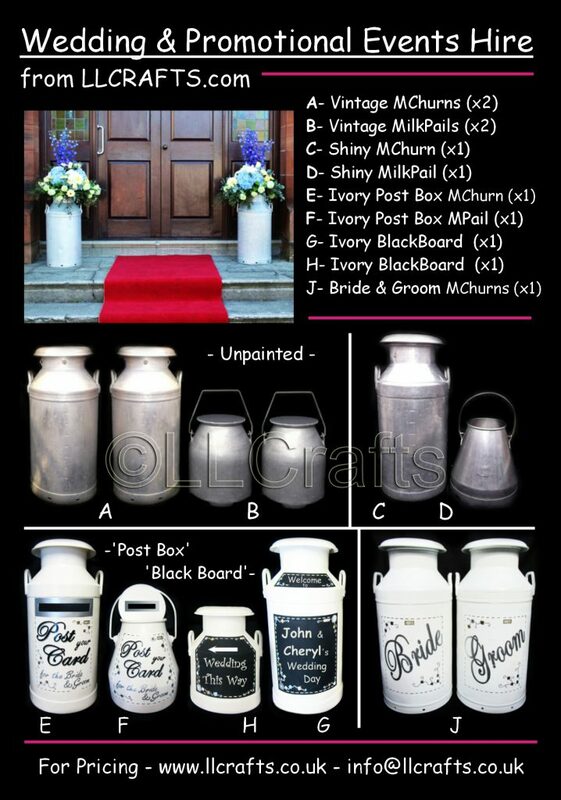 LLCrafts at Galgorm, Ballymena in NI, UK are pleased to have these very unique and quirky ‘POSTBOX Milkchurn & Milkpail’ for HIRE ….. perfect for your guests to write their comments at your wedding! They are both fibreglass, painted ivory and the milkpail is table-top size! So contact Louise or Gloria ……. and add that quirky touch to your wedding day! 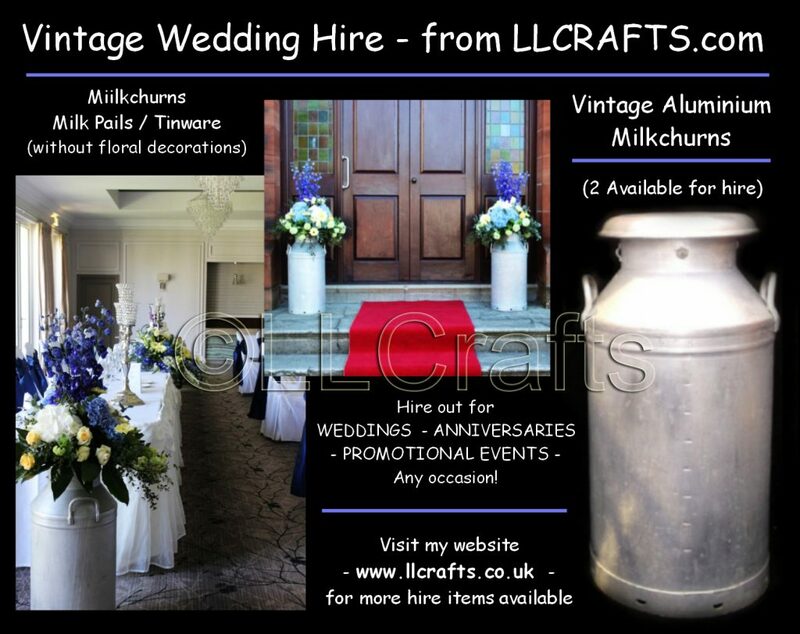 LLCrafts at Galgorm, Ballymena in NI, UK are now able to offer these brilliant ‘SHINY Aluminium Milkchurn & Milkpail’ for HIRE, for your special day or for your events show ….. perfect for displaying a set-up with a vintage twist or for your floral display at your wedding! HIRED WITHOUT FLORAL DECORATION ……. and milkchurn hired WITH or WITHOUT the lid. ONE available of each churn & pail, and they need BOOKED prior to your wedding or event day. So contact Louise or Gloria ……. and add that vintage touch to your wedding / events day! It was wonderful when the event management company Event-ful Consultancy contacted LLCrafts for the hire of our SHINY ALUMINIUM MILKCHURN …… for an events display to showcase all the great local produce, at the launch of ‘NI Year of Food and Drink’ at Titanic Belfast, through Tourism NI. Fantastic array of ‘VINTAGE MILKCANS & MILKPAILS’ for HIRE from LLCrafts at Galgorm, Ballymena in Northern Ireland, UK …… for your special wedding day or your promotional events show. Milkcans & Pails are HIRED WITHOUT Floral Decoration ……. and can be hired WITH or WITHOUT their lids.